The Death card is nothing to be afraid of. Personally I love this card and this version of it is amazingly talkative and gives a fantastic illustration of what the Death card is about. Do you feel as if you are being worn down to your bare bones today and that all that you do is all for naught and you just can’t seem to get on top of anything? Perhaps you are trying to get something started but other things keep on popping up all around you and you are stuck at square one again. If this is the case you need to sit down, gather your thoughts and listen within yourself as to what is really going on. Sometimes change can hit us like a 10 ton truck, other times it can crept upon us so silently we do either not see it coming or are in the midst of it before we realise what is happening. 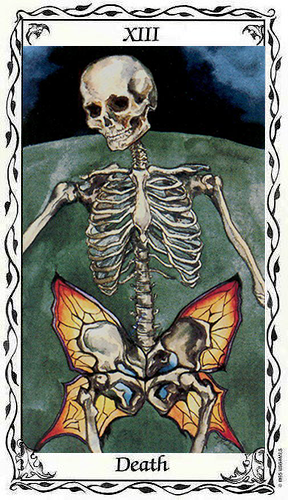 This is what the Death card is like… it is like moving from one position in your life to another and sometimes those transitions can be easy and other times they can be difficult but usually they end in a positive experience and you are happier than you were before. To add weight to today’s card I’ll clue you in on what is happening astrologically because you may just find that you are at the beginning of a cycle and you have a few weeks until the changes that are in process actually transpire around and within you. Mercury is currently at 2 degrees of Cancer and turns retrograde on Saturday. During various times over the next month or so Mercury will retrograde back into Gemini (which it rules) until it resurfaces and turns direct in early July. The date you need to watch for is around 15th and 16th July at which time Mercury is at the same degree it is today… 2 degrees of Cancer… ready to continue its travels through the sign of Cancer unhindered and also with any luck allowing you to see things from a different point of view and arise, like the butterfly in this card, from anything that has been holding you back and begin a new chapter in your life. The card used for today’s tarotscope is part of the Hudes Tarot by Susan Hudes and A.L. Samul. Hudes is a painter and illustrator living in NYC. She is a graduate of the Parsons School of Design. 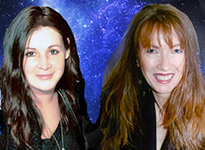 Samul has written children’s books as well as oracle and tarot books. The Hudes Tarot is published by US Games.